ABOUT VINCENT C. COLLETTI, D.D.S. Following Northwestern, Dr. Vince continued his journey to becoming a dentist at Creighton School of Dentistry in Omaha Nebraska. In Omaha, Dr. Vince and his friends enjoyed hunting, fishing, and trips down the slopes in Colorado. He continues to have a close relationship with his friends and professors from Creighton. 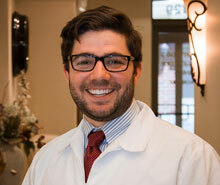 Upon graduation in 2014, Dr. Vince joined the practice to begin working with Dad (Dr. Colletti). His clinical skill is evidence to the hard work and preparation he has put forward. The two are an unmatched team in their ability to work together. Dr. Vince is involved in continuing education year round. As members of the International Academy of Orthodontics and the Academy of General Dentistry, Dr. Vince brings new technologies, materials, and techniques to the practice. We are lucky to have him here and look forward to many years to come.